Our store carries lighting resolution in a variety of collection from ceiling lamps, lamp shades, sconces, lighting accessories plus floor and table lamps, accent and novelty lamps to candle holders for display, wall decoration for all the interior and exterior purpose. The items in this section can revive, accessorize existing decorative styles. Rembrandt, Steffel, Lefton, Lenox, Continental Studios lamps in kerosene, oil or electric edition as just some of the manufacturers displayed here. You can find your vintage style inspiration right in this section to revitalize existing decor or begin a journey in a new style of decor. Vintage dark patina brass double candle holder wall mount. JASCO vintage Angel candle from 1981, 5-3/4" tall. Metal and chandelier design beads wall decor light candle holders in set of two. Glass mini hurricane Oil lamp made in Italy. Mid-century white milk glass miniature oil lamp. Vintage Iridescent Carnival glass lamp shades with waterfall beaded accents. Brass oil/kerosene lamp in hand held design. Great vintage decor. Vintage kerosene/oil lamp glass toppers, piano lamps, set of 3. Vintage Milk Glass lamp shade in elegant design with base of 7-7/8" rim. Vintage Victorian style tulip candle holder with glass dangles and marble base. Lefton porcelain Hurricane Lamp in olive green color. Winnie the Pooh rotating shadow lamp collectible for babies room, in box. Vintage SNCO Imports oil kerosene lamp teapot with decorative SAN FRANCISCO plate attachment. Vintage Budweiser Clydesdale accent Bar lamp. Italian beige colored glass kerosene or oil lamp with clear chimney. Vintage Alabastrite Resin Angel playing harp table lamp with an amazing hard plastic display lamp shade. Vintage Alabastrite Resin Angel playing violin table lamp with an amazing hard plastic 3D lampshade. Vintage Alabastrite Resin Angel playing trumpet table lamp with an amazing hard plastic display lamp shade. Two candle holder Angels playing instruments and cherub figurine all in antiqued gold tone finish decorations. Stained glass Victorian style house accent lamp. Multi color textured stained glass design lamp shade Mid Century hand made decor. Candle holder wall hanging in brass finish and kerosene lamp base. Vintage glass milk glass lampshade with wavy rims and floral bouquet decoration in white, brown, red, and yellow colors design for kerosene and other lamps. Vintage, porcelain Swordfish Nautical TV Lamp in Mid Century design. Vintage Unique Multi glass tube prisms Boudoir style table lamp clock porcelain with touch base turn on and off. 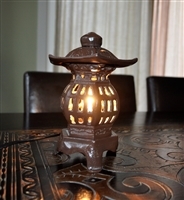 Pagoda cast iron decorative lamp. Dalmatian accent lamp, mosaic acrylic panels in stained glass design. Vintage Inuit woman figurine, table lamp with a slip-onto light bulb shade. 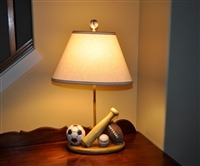 Allsports table lamp in Earth tone colors finish. Antique porcelain Hubbell socket extension and plug adapter with glass lamp shade. Large glass Hurricane lamp with Eagle burner. Large Shipwreck Nautical theme composite lamp from Continental Studios 1983. Vintage Amber glass grapes and vines decorated glass with metal elements accents. Retro style ceiling fixture in slag acrylic glass and paneled stained glass design. Vintage BOUDOIR headboard hanging accent lamp in lace and half doll porcelain finish. Amber glass table lamp with brass accents. Victorian Kerosene metal lamp conversion to the electric ceiling lamp in Cottage Chic or Nautical style. Vintage Boudoir accent lamp with porcelain figurines and original lamp shade, Mid Century. Vintage Boudoir accent lamp with porcelain couple and original shade, Mid Century.